Your driveway is the entrance to your home; the first thing guests will see. At Domenico Parravano and Sons, we put the quality craftsmanship we call “Roman Style Concrete” into every driveway we install, repair or replace. We’ve crafted quality concrete driveways in Baltimore City, Towson and Baltimore County since 1977. The first step is a complete inspection of the site and any existing driveway. We’ll look at the drainage situation and ensure the correct grade is established by grading out the area if necessary. Every job we take on receives the attention to detail and commitment that comes with the Domenico Parravano and Sons name. 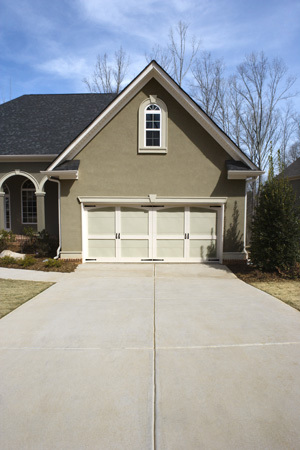 Concrete Driveway Pavers: Pavers offer versatile design options for color, shape and texture. In addition, pavers are easy to replace in sections if necessary, and can be driven on immediately after installation is completed. Colored Concrete: Choose from traditional shades of white and gray or more vibrant colors that can make a bold statement or blend in with your landscape. Stamped Concrete: The high-end look of a stone or brick driveway can be accomplished at a fraction of the cost by imprinting patterns in new concrete. Available in a variety of colors and patterns. Exposed Aggregate Driveway: Adding exposed gravel an aggregate to the concrete mix can create a unique texture and add skid resistance.